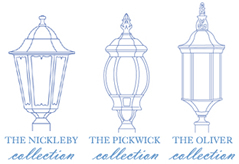 At Keengardener, we have a new range of Victorian Style Lanterns now in stock and available for next day delivery. They include a charming collection of classically styled Victorian lights, beautifully crafted from dye cast aluminium with polyester powder coating to be virtually rust free and extremely long lasting. There are five types to choose from â€“ Pathway â€“ 1.24m (4â€™1â€), Driveway â€“ 2.22m (7â€™4â€). Wall Lanterns, Post Top Lanterns and Bulkheads are also available. Sizes vary slightly but average size is 20â€ height and 10â€ diameter. There are also three colours available â€“ Chimney sweep black, Classic Verdigris (green), or White with gold brush effects. We can also drop-ship on behalf of garden centres and lighting specialists â€“ please get in touch if youâ€™re interested in showcasing a Lamplighters stand or including the range in your catalogue.